What's an artist to do? Other artists were becoming associated with all of the traditional figures painted in Chinese culture. He had mastered painting birds and flowers but he wanted to do something different; something for which he would be recognized as the first artist to specialize in painting. So, he chose gibbons. Habitat destruction would come hundreds of years later, but during the Song Dynasty, Yi Yuanji focused on painting these lesser apes. Yi Yuanji, also known by the name Yüan-chi under the Wade-Giles romanization system of the Mandarin Chinese language, lived from 1000 to 1064 and was a Northern Song Dynasty (960-1279) painter. Song Dynasty painters emphasized Taoist and Buddhist concepts. Their paintings were typically landscapes, often with mountain peaks far off in the distance. Space was often filled with a mist-like pale wash while black was used for trees and rocks. Yuanji would travel over 100 miles to the Wanshou mountains to observe gibbons and other animals in their native environments. He built a backyard garden where he raised wild plants and animals where he could observe the animals in a natural environment. 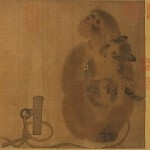 He painted realistic paintings of roe deer, monkeys, gibbons, peacocks, seasonal flowers, fruit and vegetables but it was his depictions of monkeys and gibbons which made him one of the most important painters of the Song Dynasty. During the last year of his life, Yuanji was summoned to the Ching-ling Palace to paint screens which would be placed behind the Emperor's seat. The screens so impressed the Yingzong Emperor that the Emperor commissioned the artist to paint the “Picture of a Hundred Gibbons”. The artist died after having only completed a handful of gibbons; perhaps poisoned by jealous rivals.